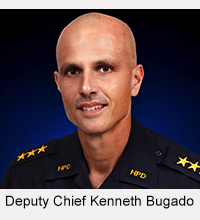 The Kona Crime Prevention Committee recognized Officer Sharon Yoon as “Officer of the Month” for April in a luncheon ceremony on Wednesday (April 4) at Huggo’s restaurant in Kailua-Kona. Yoon was honored for her efforts in a burglary case and a drug case. Yoon was assigned to the burglary case on January 1. Using her investigative skills, she linked a man and his girlfriend to the crime. Both were charged with first-degree burglary and second-degree theft. Further investigation linked the man and a male accomplice to other burglaries and thefts around the island. The accomplice was also arrested, and police recovered some of the stolen property. 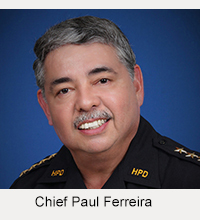 In December, Yoon drafted a search warrant for a Kona home after observing numerous marijuana plants growing on the property. The search warrant led to the recovery of 96 marijuana plants, 1,198 grams of dried processed marijuana, 2 grams of hashish, drug paraphernalia, a firearm and ammunition. A male suspect was arrested and charged with numerous drug and firearms offenses. 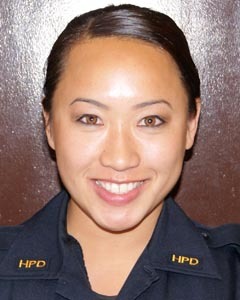 In nominating Yoon for the award, Sergeant Akira Edmoundson noted that she joined the Hawaiʻi Police Department four years ago and has proven to be an asset to the department. “She continues to strive for excellence in her performance and has demonstrated a high level of competence in her investigations,” Edmoundson said.